Florida- Dogs on leash may be used to trail wounded game mammals. 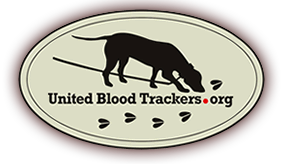 You may track at night by flashlight, but it is preferred that tracking wounded game take place at dusk or the following morning if the weather permits. You are permitted to carry a weapon at night, but you are not allowed to discharge the firearm during non-shooting hours.